Deputy Jesse Maddox's reputation in Beach Pointe is...less than stellar. He thought following in the footsteps of his late father, a former cop, would make up for it. Not quite. Every time he closes his eyes, his past is there to haunt him. After falling asleep on the job (again), the sheriff gives him an ultimatum. Get counseling for whatever's keeping him awake at night or get out. Jesse would rather have a root canal, but he goes anyway, expecting a big waste of time. What he doesn't expect is to fall in love. There’s no way a handsome billionaire would pay money for me. I’m mousey and look like I stepped right out of the nerd brigade. It’s not like the guys were beating down my door, so I figured I’d sell my virginity for some extra cash. At first, I thought the website was a scam. But when a handsome stranger shows up at my work in a limo and demands that I come with him, I’m swept off my feet...and not in the way I expected. Romantic comedy junkie Natalie lives out those fantasies in real life three New Year's Eves in a row when fate throws her together with the same handsome stranger. A heartbreaking turn of events leaves her swearing off of love, forevers, and the holidays (bah humbug). That is until the mystery man from her past reappears years later. Over a holiday season, Natalie struggles to reconcile the whimsical notions of her past with the practical sensibilities she has worked so hard to develop. With the countdown to a new year looming, she must decide whether or not she is willing to give happily ever after another shot. To say that Natalie is reluctant to go out with her friends on New Year's Eve is an understatement. However, a certain man saves her from an unwanted advance right before midnight. The following 2 New Year's Eves, the same certain man makes it a point to be at the same bar where he originally met Natalie. However, after being jilted, Natalie swears off of her romantic notions and focuses on her work. Several years later the mystery man reappears… What will Natalie decide to do? Continue to live life as an angry feminist or open her heart? Kay Heart has a pretty name as well as pretty voice. She is able to capture each of the characters' essence(s). Well done! I received a copy of this book in exchange for my unbiased review. I would love to listen to a book(s) by Laura Chapman that follows these characters and/or the other characters we met in What Happens at Midnight. It is a perfect set up for a series, in my opinion. Thanks for reading my review, if you found it helpful please select 'helpful'below. Consider following me on Audible. 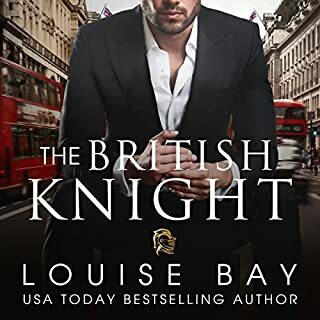 I’m am reviewing this book for Audiobook Obsession, thank you Laura Chapman, and Kay Heart the narrator, excellent job. This novella is a gem. Boy, Rob, meets girl, Natalie every New Year’s Eve for three years, on the fourth he promised to be there and is a no show, so she thinks. Time moves on as does Natalie. Till Rob reappears in her life. After all the confusion dies down, some groveling and of course the best part, we have a HEA. This romantic comedy was dripping with sarcasm! I LOVE sarcasm humor! Nathalie repeatedly meets the same handsome man during a New Year's Eve party when he rescues her from several drunk suitors. A romantic at heart she wants to get to know him more except he doesn't show the following year leaving her heart broken. When by chance they meet again they've both changed and there is still a flame. Some of the wise-cracks were so sarcastically funny that I wanted to keep them in mind and use them myself later ! Kay Heart did an amazing job on the narration - her voice and sense of timing was fantastic. What if your heart was stuck on repeat and had to relive the same heartache all over again? Will there ever be the chance to finally get love right? Chapman will most certainly own a piece of any heart with What Happens at Midnight. Natalie is a combination of hopeless romantic and heartbroken dreamer. When fate presents her with the opportunity to get her happy ending, nothing will keep her from taking a chance on forever. From the charming dialogue, captivating story and angst filled narration Chapman and Heart ring in the new year with a bit help from the ghost of Christmas past and the magic of a Happy New Year. A sweet love story ! It was sweet , and did have some twist and turns . The story kept the listener wanting to listen to the audible book in one night . Five stars for the author . She wrote a sweet love story . The narrator Kay Heart .Did an amazing job reading and acting out both the male and female characters . A great audible book to listen to on New Years Eve or anytime .
'' Meet me on New Years Eve "
This was my first Laura Chapman's book. This is a short and sweet romantic comedy, that sits around the Holiday period, for a few years. Rob and Natalie's slow burn story is filled with misunderstandings and a lack of communication. The story is written with only Natalie's POV, and I would have liked to have Rob's POV all along the story. I love their happy ending. Overall, this is a fun listen and I enjoyed my listening. Kay Heart has done a great narration, easy to understand. I received this free review copy audiobook at my request and I have voluntarily left this review. If you want to complete a book in three hours or less, then this would be a good choice. It is a nice romantic comedy with a little bit of misunderstanding thrown in. The author starts off the mood great with an excellent opening, and the narrator does a good job in keeping you interested. It is a quick book that has its HEA. What Happens At Midnight captures what we all wish would happen to us on New Year's Eve. Natalie and Rob cross paths multiple times over the years on NYE, each interaction making it clear to the reader just how perfect these two are for one another. When outside forces push them apart and then back together, you wonder if they'll realize what they have in front of them or will they let it slip away? My only reservation is the voice work. The two main characters, Natalie and Rob, sounded great and were easy to listen to. However, in an attempt to differentiate between the secondary characters, the narrator either talked really slow or high pitched and fast. This narration choice pulled me out of the story. I'd note that it wasn't enough to make me stop listening. All in all What Happens At Midnight is a fun holiday listen, perfect entertainment for an evening of wrapping gifts or decorating the tree or soaking in a hot bubble bath. This was a cute story. I loved how it fast forwarded each year to New Years midnight. I felt the ending ended too soon but it was still good. I guess I wanted more. Natalie is focused on finishing her Master and then her doctorate...leaving little time or desire to date or just go out for the evening on New Year’s eve. She is talked into going and meets a guy, has a bit of a connection but doesn’t exchange names or numbers. They meet again two more years and the year they actually plan to meet he doesn’t show. Rob is sweet funny and breaks her heart when he fails to show. Many sweet make you smile moments...heartbreak for Natalie....but they meet again in an unexpected way...will there be a reconciliation...is there an explanation about what happened to Rob? Is his like the romantic movies Natalie watches? 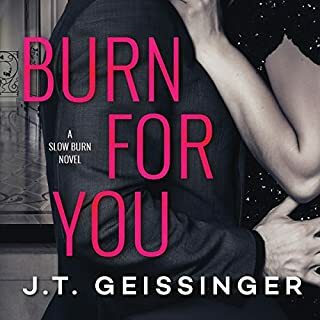 i loved the narrator’s voice..perfect for Natalie, the men and secondary characters...would be great fun to follow more of the people in Natalie and Rob’s world and what happens to them. 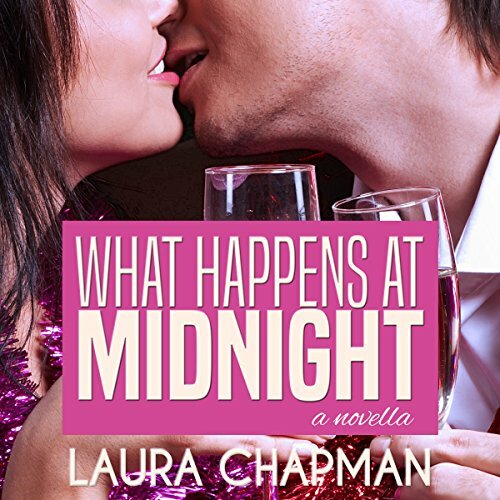 If you are a fan of movies like When Harry lives Sally, An Affair to Remember and Sleepless in Seattle Laura Chapman’s What Happens at Midnight belongs on your TBR shelf. Natalie and Rob make an instant connection, there is a spark of interest that can’t be denied. I thoroughly enjoyed the bumpy journey till their HEA. I thought the narrator Kay Heart did a great job in keeping the narration upbeat. I was fortunate to receive an audible credit via Audiobook Obsession. Lovely short audio to kickstart the year. Nice characters. The only thing is I’d like to of seen more from the characters and storyline. But hopefully there will be more from these guys. Rob and Natalie have the cutest story. When Natalie’s BFF brings her out to a bar on New Year’s Eve just to leave her hanging. Rob comes to the rescue by saving her from the face licking boy. They keep meeting each New Year’s Eve until one year that Rob hit his lowest and see her with another guy. Will Natalie be able to forgive him or just be the best friend of he cousin? “What Happens at Midnight” is a sweet and enjoyable fun romance. It is well written and well told, Laura Chapman fit a lot of story into her novella. The book captures your attention from the start and holds it there until the end. The storylines and characters are interesting and well developed. I liked that Natalie was smart, strong minded and stayed true to herself. The story takes place over several years and while it starts and ends on New Years Eve but it can be enjoyed year round. Laura Chapman, thank you for this great story. 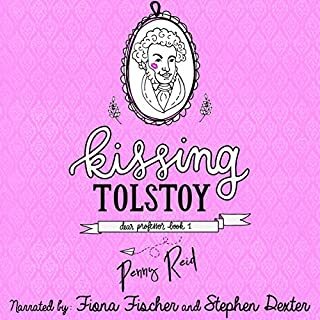 I listened to the Audible edition, Kay Heart does a wonderful job narrating and telling the story. She performs the voices for all the characters and brings them to life from the pages to your ears. Thank you for this enjoyable story and listen. A chance meeting at a bar on New Year's Eve can change your life. At least for Natalie and Rob it did! Natalie does not like going out, but went at her friend's nudging. She met Rob, and when asked to join his friends, she declined. Who would have thought these two would ever meet again? And at the same bar a year later? Their relationship takes a turn, and they decide to meet again the following New Years and if things work out to their advantage, they will see about pursuing a relationship. Unfortunately, one does not show up and now things take a complete turn. What happened? Will they ever see each other again? Give this short, rom com a listen. 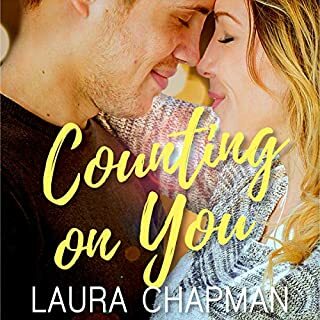 Laura Chapman gives us a fun, flirty and romantic novella sure to make you smile and warm your heart. Narrated by Kay Heart, you will love it.